Join Cope, Marsh, Mudge, Williston, the Sternbergs, H. T. Martin, L.D. 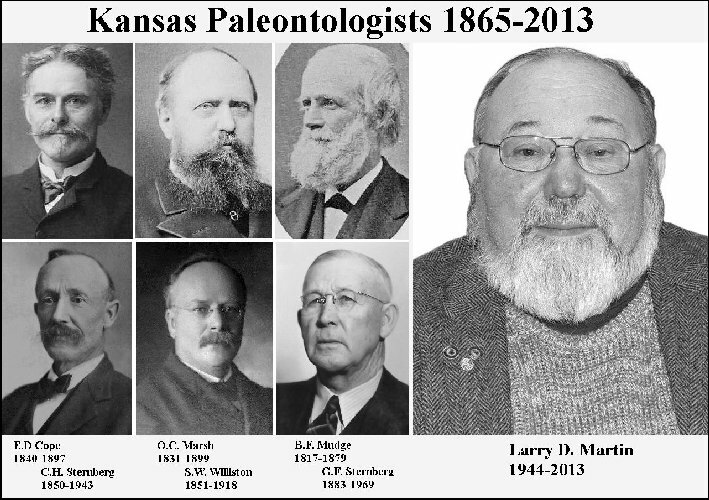 Martin and the many others who have reported on fossils from the Western Interior Sea and the Midwest. 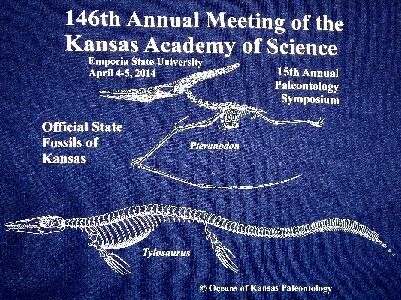 LEFT: The design on the shirt given to authors at the 2014 Paleo Symposium. 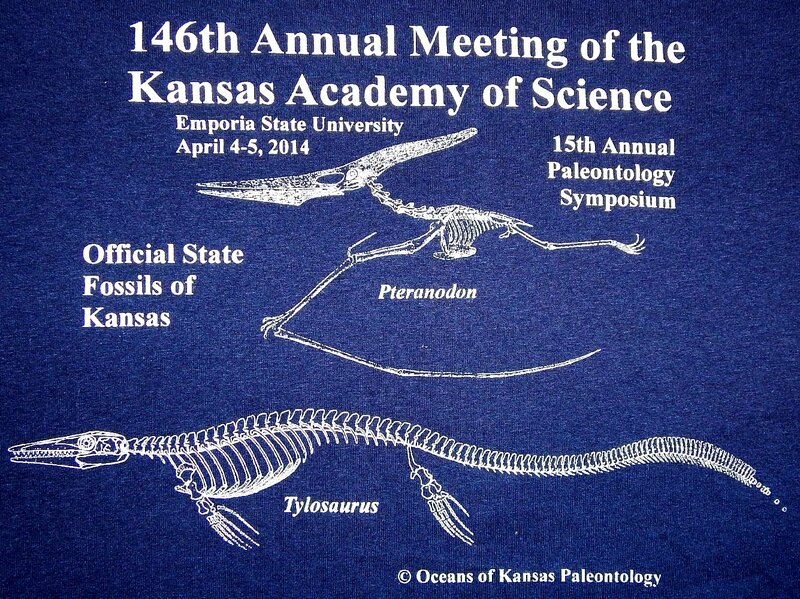 The design commemorates the designation of two official Kansas State Fossils, signed into law in April, 2014. 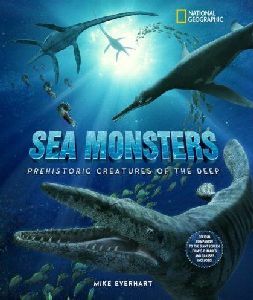 AN ACT naming the state marine fossils; the Tylosaurus and the Pteranodon. Section 1. 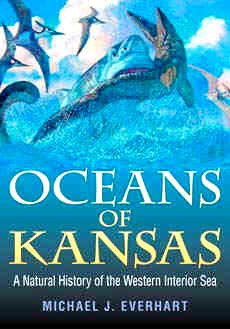 Tylosaurus, a giant mosasaur which inhabited the great inland sea that covered portions of Kansas during the Cretaceous period of the Mesozoic era and grew to lengths of more than 40 feet, is hereby designated as the official marine fossil of the state of Kansas. Sec. 2. Pteranodon, a great, winged pterosaur with a wingspread of more than 24 feet, which flew the skies of Kansas during the Cretaceous period of the Mesozoic era, is hereby designated as the official flying fossil of the state of Kansas. Sec. 3. This act shall take effect and be in force from and after its publication in the statute book. Aber, S.W., Peterson, A., Peterson, N. and Johnston, P., Science & Math Education Center, Emporia State University. UPPER PENNSYLVANIAN VERTEBRATE FOSSIL DISPLAY FROM THE SNYDERVILLE SHALE, GREENWOOD COUNTY, KANSAS. A serendipitous vertebrate fossil find by Naomi Peterson occurred when scouting an alternate route for an existing utility distribution line in Greenwood County, southeastern Kansas. She was granted permission to collect fossils and returned with current and former ESU earth science students and faculty. Numerous fossil fragments were collected from the surface. Preliminary identification suggests amphibian, fish, and reptile-like remains (see abstract by Morales). The fossils are derived from the Snyderville Shale Member of the Oread Formation, Shawnee Group (Virgilian Stage, Upper Pennsylvanian). This represents a regressive phase of the Toronto Limestone-Snyderville Shale minor cyclothem. A marginal marine or estuarine depositional environment is consistent with this fossil assemblage. Similar Upper Pennsylvanian vertebrate fossils have been reported since the 19th century in eastern Kansas. Benjamin Mudge recognized fossil amphibian footprints in sidewalk flagstone on Kansas Avenue in Topeka. 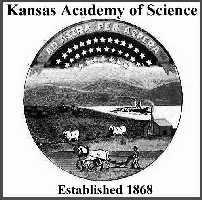 He traced the flagstone to a quarry in Osage County and published his findings in the Transactions of the Kansas Academy of Science (1873, vol. 2). Walter Schoewe subsequently identified this as the Howard Limestone (Wabaunsee Group) in 1956. Martin and Merriam described a partial labyrinthodont amphibian skull from the Wood Siding Formation in Wabaunsee County (TKAS, 2011). Preliminary research shows these previous finds are higher in the stratigraphic section, which highlights the potential significance of this vertebrate fossil discovery. Connolly, A., Golab, J. and Hasiotis, S.T., Geology Department, University of Kansas. THE KU ICHNOLOGY WEBSITE: THE MOST EXTENSIVE ICHNOLOGY WEBSITE AVAILABLE FOR ANYONE TO USE. The KU Ichnology website (http:ichnology.ku.edu) is currently striving to be one of the most extensive websites on ichnology. The website is available to the public and can be used from professionals and academics to everyday people who want to learn more about trace fossils. We provide introductory guides to trace fossils and ichnology and communicate complex ideas in the form of simple and easy-to-read diagrams and models. We have a huge trace fossil index of confirmed ichnogenera published. As of February 2014, we have over 400 ichnogenera available. Our index is diverse as it contains trace fossils made by invertebrates, dinosaurs, mammals, birds, and so forth. Each ichnogenus, if available, has its own webpage with a collection of descriptions accompanying it including the original author who erected the ichnogenus, the morphology of the trace fossil, the trace fossil’s age, possible trace makers, and environment the trace fossil can be found in. Sometimes, the ichnogenera have photos or line drawings of them which can further clarify what the trace fossil looks like. Our website is open for input, contributions (via papers or images), and criticisms. You can reach us at our email address ichnology@ku.edu. We have an exciting set of goals to continue the growth of our website which include a searchable database, trace fossils in core, modern analogues of trace fossils, and dichotomous keys. Everhart, M.J. and Everhart, M.M., Sternberg Museum, Fort Hays State University. 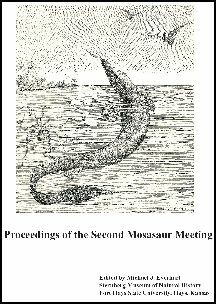 A NEW SPECIMEN OF SAURODON LEANUS AND A BRIEF HISTORICAL REVIEW OF THE DISCOVERY OF SAUROCEPHALID FISHES. Saurocephalids, including Saurodon leanus, are an extinct group of Late Cretaceous fishes in the Family Ichthyodectidae. They are readily recognizable by the presence of a predentary bone on the lower jaw that supported a sword-like projection. The first known specimen consisted of a tooth-bearing jaw fragment collected by Lewis and Clark in August, 1804, from an exposure along the east bank of the Missouri River in what is now northwestern Iowa. Although the specimen was originally labeled as the “jaw of a fish or some other animal,” it was later described as a marine reptile and named Saurocephalus lanciformis (Harlan 1824). Saurodon leanus Hay 1830 was also initially described as a reptile from a partial skull discovered in the green sand of New Jersey. Leidy (1856) was the first to formally note that the specimens represented the remains of fish. Additional species were subsequently named from the Smoky Hill Chalk by Cope, but the distinctive predentary bone was not recognized until described by Stewart (1898). Here we report the 2013 discovery of a complete, articulated skull of Saurodon leanus from the upper Coniacian of the Smoky Hill Chalk in southeastern Gove County. When discovered the skull was lying on its left side with the jaw open. Five vertebrae were attached to the back of the skull, but no other post-cranial remains were present. Total length of the specimen, including the 25 mm skull, is 44 cm. Length of the lower jaw and 7 cm predentary is 27 cm. Hamm, S.A.1, Barnes, K.2, Bell, G.I. Jr.3 and Polcyn, M.4, 1. 8527 Nantucket, Wichita, 2. Mosasaur Ranch Museum, Terlingua, Texas, 3. Guadalupe Mountains National Park, Salt Flat, Texas, 4. Shuler Museum of Paleontology, Southern Methodist University, Dallas, Texas. morphological variations in Ptychodus mortoni (Elasmobranchii: Ptychodontidae). The Late Cretaceous durophagous shark Ptychodus mortoni is diagnosed by teeth with a high conical crown with ridges that radiate from a single point at the apex. Morphological variation in newly recovered articulated and associated tooth sets from the Boquillas and Penn Formations in the Big Bend region of Texas prompted a review of specimens referred to P. mortoni and has revealed a number of differing tooth morphologies ranging from lower Middle Turonian to Santonian in age (~92.5 to ~84 MA). A unique combination of characters allows differentiation of 9 morphotypes. There appears to be some temporal segregation of morphotypes, but influences of ontogeny, individual variation, regional, variation, and anagenic change are poorly understood at this time due to sample size and prior lack of recognition of variation in the literature. Nonetheless, the diagnosis of P. mortoni at this point is too general and does not document the range of morphology present in this taxon, and thus limits the potential biostratigraphic utility of the taxon. This study provides new data on morphological variation within P. mortoni in a temporal framework that may improve the biostratigraphic utility of this taxon in the future. Hammersburg, S.R. and Hasiotis S.T., Department of Geology, University of Kansas. THE ICHNOTAXONOMY OF THE CAMBRIAN SPENCE SHALE OF UTAH. The Cambrian Series 3 Spence Shale is a well-known Konservat-Lagerstätte producing numerous well-preserved trilobites, echinoids, and soft-body tissues of arthropods and worms. The Spence Shale was deposited on a carbonate ramp on the northwestern edge of Laurentia and consists of calcareous shale with intervals of peloidal and oolitic limestone. The Spence Shale is the oldest middle Cambrian unit with Burgess Shale-type preservation (BST) in North America and is unique as it contains BST soft tissues in the same stratigraphic intervals as ichnofossils. Ichnofossils are important tools for reconstructing ancient environments and can indicate paleoenvironmental conditions during and after deposition as well as the associated paleoecology of a deposit even when body fossils are absent. Although numerous body fossil studies have been conducted on the Spence Shale, an ichnotaxonomic treatment has never before been attempted. To date, 15 ichnogenera and 12 ichnospecies have been identified: Arenicolites, Bergaueria (B. hemispherica and B. sucta), Cochlichnus, Cruziana (C. problematica), Diplichnites, Gordia (G. marina and G. arcuata), Gyrophyllites, Monocraterion, Monomorphichnus (M. lineatus and M. multilineatus), Neonereites (N. multiserialis), Phycodes, Planolites (P. annularis), Rusophycus (R. carbonarius), Sagittichnus, and Treptichnus (T. bifurcus and T. pedum). Deposit and filter feeding, dwelling, grazing locomotion, and predation are represented by ichnofossils, which were produced by various tracemakers (mostly annelid worms and trilobites). The most common behaviors represented by these ichnogenera are deposit feeding and locomotion. Several ichnofossils are suggestive of predation behaviors: Planolites terminating at a Rusophycus. The ichnofossils represent mostly a depauperate, distal Cruziana ichnofacies and depauperate Skolithos ichnofacies. Hoffman, B.L., Claycomb, G.D., and Hageman, S.A., Park University, Parkville, Missouri. OCCURRENCE OF A CTENACANTHOID SHARK, HESLERODUS DIVERGENS, IN THE FARLEY LIMESTONE (UPPER PENNSYLVANIAN) OF MISSOURI. Acetic acid macerations of sediments of the Farley Limestone Member of the Lane Shale Formation of the Kansas City Group (Upper Pennsylvanian, Kasimovian) have yielded numerous teeth of the ctenacanthoid shark Heslerodus divergens (Ginter, 2002). These are the most common shark remains found in the Farley Limestone, unlike the underlying Wyandotte Limestone Formation sediments, in which symmoriid remains predominate. Other chondrichthyan remains found include several petalodont tooth types, the ctenacanthoid Zangerlodus williamsi, the hybodont Maiseyodus johnsoni and several symmoriid teeth and denticles. This appears to represent the first record of Heslerodus divergens in Missouri. Itano, W.M., Natural History Museum, University of Colorado, Boulder. MACROWEAR ON A TOOTH OF EDESTUS : IMPLICATIONS FOR FUNCTIONAL MORPHOLOGY. A symphyseal tooth of the “shark” Edestus sp., TMM 46034-1, was found in the office of the late Dr. Wann Langston, Jr. (1921-2013) of the Texas Memorial Museum, University of Texas, Austin. The tooth is truncated apically. The apical surface of the surviving portion of the tooth is smooth and slightly convex, as if worn by abrasion. It was found in the Smithwick Shale, of Atokan (Middle Pennsylvanian) age, near Bend, San Saba County, Texas. According to unpublished notes, Langston realized that the form of wear could provide evidence as to the manner in which the symphyseal teeth of Edestus were used. However, he failed to reach any conclusions, or at least did not record them. Recently, I have proposed that the symphyseal tooth whorls of Edestus, which are present in both the upper and lower jaws, were used, not in opposition, like scissors, but with an up-and-down motion of the entire head, with jaws fixed relative to each other, to slash prey. The apex of the Edestus tooth may have been broken off in an act of attempted predation. The apical surface of the remaining part of the tooth may have been worn smooth in repeated acts of attempted predation on massive prey having an abrasive outer covering, such as large fish having skin covered with scales or dermal denticles. Jones, M.F. and Hasiotis, S.T., Department of Geology, University of Kansas. Paleontological implications of bat trackways and trackmaking ability based on neoichnological observations of the fruit bat Carollia perspicillata . Bats (Order: Chiroptera) are among the most diverse and species-rich mammals. The bat fossil record dates to the early Eocene, and fossils are known from all continents except Antarctica. Despite their body fossil record, no trace fossils attributed to bats are known, unlike the other groups of flying vertebrates: birds and pterosaurs. Additionally, knowledge of the terrestrial locomotion of bats is limited, with most research done on such terrestrially competent species as the common vampire bat (Desmodus rotundus) and the New Zealand short-tailed bat (Mystacina tuberculata). No detailed descriptions of bat trackways or trackmaking ability have been published for any bat. We present the first study of the neoichnology of modern bats. Individuals of Seba’s short-tailed bat (Carollia perspicillata) were subjected to walking trials on medium-grained sand at 12% and 21% moisture by weight percent. Trackmaking behavior was documented with photography and videography. Resulting tracks and trackways were cast with dental plaster for further study. Bats performed two primary locomotor behaviors, at least two minor locomotor behaviors, and one nonambulatory trackmaking behavior. Tracks produced included elongate manus impressions, isolated pedal tracks, pedal track clusters produced by the nonambulatory searching behavior, and arcuate impressions that correspond to movement of the manus. Tracks from C. perspicillata and other bats of varying morphology, phylogeny, and terrestrial ability will be used to establish a database for comparison to potential bat tracks found in the rock record. Bat trackways may be useful for interpreting the ecology and life history of the similarly quadrupedal flying pterosaurs. King, S.D., Museum of World Treasures, Wichita. Identification of a Tyrannosaurus specimen and a discussion of its gastralia and their function. A Tyrannosaurus specimen (MOWT L23-001-007) that has been on display at the Museum of World Treasures in Wichita, KS, for seven years is formally described for the first time. The specimen was found in the lower Hell Creek Formation (Maastrichtian, Late Cretaceous) in Harding County, SD. The skeleton consists of approximately 137 bones, most of them representing the axial skeleton. Based on comparisons with published descriptions of FMNH PR2081 and on the locality of its discovery, the specimen is identified as a Tyrannosaurus rex. The skeleton includes several elements of a gastralial basket. The first two and possibly the third rows were fused into a single unit. Up to four articulation facets remain on both the dorsal and ventral side of each gastralium and these correspond to a maximum of five and minimum of two facets on each side of a gastralium. The number of facets shows that there was a minimum of two points of articulation between adjacent gastralia, which indicates that the gastralial basket was a ridged structure. A ridged gastralial basket conflicts with a previous idea that the gastralial basket could expand and contract laterally to facilitate breathing. Instead of lateral movement, respiration could be accomplished by elevating and lowering the basket. Morales, M., Johnston Geology Museum, Emporia State University. FIRST Report oN the Discovery of Vertebrate Fossils in the Snyderville (SHALE) Member of the Oread (LIMESTONE) Formation (Upper Pennsylvanian, Virgilian) near Toronto, Kansas. The recent discovery of vertebrate fossils in the Snyderville (Shale) Member near the town of Toronto, Kansas appears to be the first occurrence of such fossils from this rock unit, which extends from Nebraska into Missouri and from Oklahoma into Iowa. Stratigraphically the Snyderville lies between the underlying Toronto (Limestone) Member and the overlying Leavenworth (Limestone) Member. All three members are within the Oread (Limestone) Formation, which is part of the Virgilian Stage, upper Pennsylvanian Series of Kansas. The Snyderville is approximately 300 million years old. Both the Toronto and Leavenworth limestone members are marine, but the intervening Snyderville includes marine and non-marine deposits. Generally, both the lower and upper Snyderville typically comprise mainly near shore shale deposits with a diversity of marine invertebrate fossils including bryozoans, brachiopods, clams, gastropods, nautiloid cephalopods, barnacles, ostracodes, crinoids, and echinoids, along with foraminiferans and algae. The middle Snyderville includes sandstones, mudstones and paleosols, which probably represent transitional to non-marine environments of deposition, but few fossils have been reported from these deposits. The new vertebrate fossils were discovered by Naomi Peterson and collected by her and family members. Most specimens were collected as float, having weathered and eroded out of red and gray shale deposits. The fossils are well preserved but completely disarticulated. They represent a variety of vertebrate groups, including fish (fin spines, jaw fragments with teeth, vertebrae), amphibians (ornamented dermal bone, jaw fragments with teeth, limb and girdle bones, phalanges, vertebral centra), and reptiles (teeth, limb and girdle bones, phalanges, vertebrae). The fossils come mainly from a horizon in which the bones seem to be concentrated; therefore future excavation at the site should yield many more vertebrate specimens.